Darth Vader is of course a geek icon. Statues of former Russian leader Vladimir Lenin is also an iconic sight, though a relic of communism. 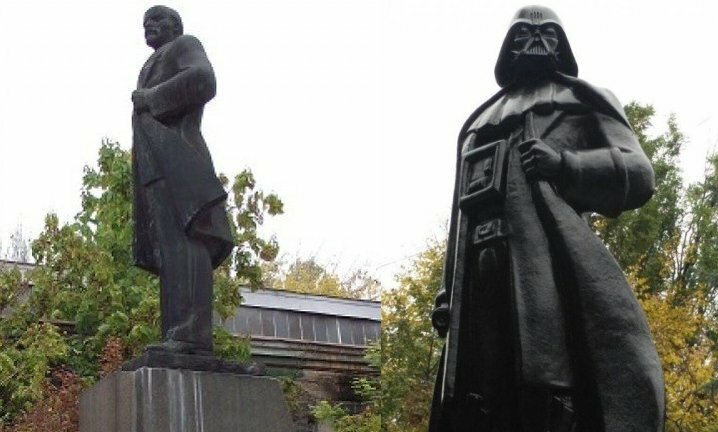 And now a Lenin statue in the Ukraine has been transformed into Darth Vader. Residents of Odessa where the Lenin statue resides, decided they wanted something different and thought that it was “time for new heroes,” according to Russian news agency TASS. Well, Vader did redeem himself eventually. I guess the evil Galactic Empire is less evil than communism to these folks. I guess they never saw Vader force-choke someone. Sculptor Alexander Milov helped to cast the new sculpture right over the existing statue. I picture Lenin being tormented inside. As an added bonus, the statue even houses a Wi-Fi router with free internet access. Vader is already winning them over with gifts. There is actually a good reason that this happened. It is really due to a new Ukrainian law designed to erase reminders of their communist past. Now they can have a statue that is more fun and represents pop culture. They officially unveiled it on Friday.